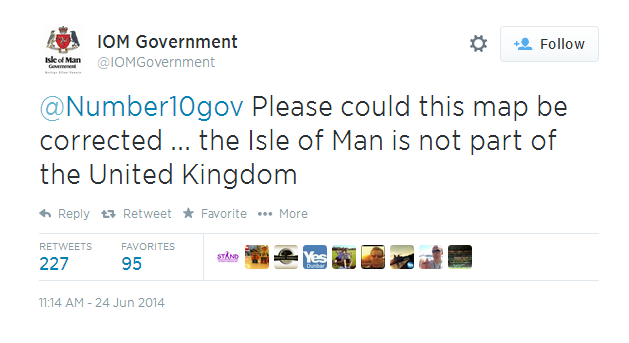 An extraordinary online disagreement has emerged between the UK government and the Isle of Man government over leaflets which have been produced by Number 10 promoting Scotland remaining part of the UK. Is it only me finds it strange that the only official communication between the UK government and its Crown Dependencies seems to be via Twitter? Or that nobody in the UK government seems to know what the UK is? And is it only me finds the levels of amateurishness emanating from Cameron’s office truly embarrassing? The UK Govt has effectively bankrupted the Isle of Man reducing VAT subsidies payable on a vat sharing scheme by up to 200 million per year. This has had a serious effect on Manx Government income. Im not taking sides just pointing out that the Manx Government has an axe to grind. I think its extraordinary that the UK Government is using Twitter to plead to the Scottish People to say Yes to another decade or more of Austerity. The People of Scotland are waking up to the fact that a No vote is a vote for more food banks, privatisation of the Scottish NHS, Paying up to 9k per year for University Education and a host of other negatives and its looking more likely that our young will be used as cannon fodder in more UK imperialistic adventures. i think a yes is as well. If we could have a referendum on independence from Whitehall and Eton, the Royals, and Oxbridge too, we may rustle up a football and cricket team worthy of the name. (That’s just for starters). 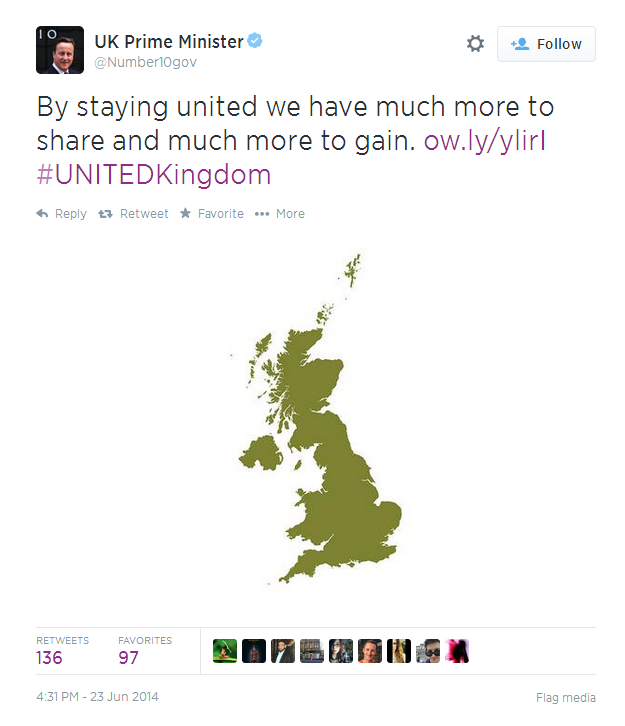 yes quite a concept…if scotland can seek independence from the union why not england? To be fair to No 10 they have a lot of detail to hold onto, there are islands and other islands, and then there is the NHS that they have lost control of, plus all those Schools that they are now running, plus the Islands and soon there will be holidays to cope with, not to mention their trust funds. There is another aspect in which this is embarrassing. Scotland is now introducing a named-person for every child in Scotland to oversee the wellbeing of every child. Scotland is also connected to what happened in the Isle of Man: The Isle of Man rightly threw that policy out when it became unmageable. So many threads to undermine the sovereignty of a nation – so many threads to undermine parents. It`s all connected. Best wishes with your research. Dragging the union into disrepute! I wonder if Tory indifference to the Isle of Man has anything to do with its ‘tasty’ tax status. This is actually highly ironic: the government produces a leaflet arguing that Scotland should remain in the UK, which annoys the Isle of Man, because it shows them as part of it. As for the nature of the UK itself, there’s a subtle difference between Great Britain, which includes territories like the Isle of Man and the Channel Islands, and the United Kingdom, which doesn’t. It’s quite convoluted, and I’ve forgotten just about all of the arguments, with the exception that there is some kind of difference. And both the Channel Islands and the Isle of Man are very keen to assert that while they’re British, they’re not part of the United Kingdom. There’s a lesson for Alex Salmond there. He wants independence, while retaining some links with the rest of the UK, like sharing the monarchy and the ability of the Scots to serve in the British armed forces, as well as retaining the pound. Possibly he’d be better off going the way of the Isle of Man, and confusing the rest of Britain by being British while also being independent. Great Britain is Scotland, England and Wales – ‘great’ being the largest island in the geographical entity the British Isles. The Isle of Man, Jersey, Guernsey, the Outer Hebrides etc. are all part of the British Isles – as is Ireland – but Great Britain is basically the mainland. Citizenship and geographical nationality are also two separate things – Scotland will remain part of Great Britain as a geographical location and residents there can still class themselves as British if they so wish, but British citizenship (where passports and such are concerned) will only extend two generations after independence. Sorry nuggy, but you are completely wrong. A “yes” vote is NOT a vote for the points made by Lenny. If you want to discuss them with me then please do, but I don’t think you will, or are capable of doing so. Lenny – Agreed, especially your last point… though I would also emphasise the FAR larger number of non-UK people killed, maimed, and abused by the recent UK imperialistic adventures. OBD – …because most voters in England ACTUALLY WANT a Tory government! “Great Britain is Scotland, England and Wales” – Strictly speaking that’is historically true, but because the topic is about “the UK” your point is pointless! OBD – I agree, but I also feel desperately sorry for all those moral and rational people in the rest of the UK who will soon be condemned to a permanent Tory government after Scotland becomes independent, and that means an end to democracy in rUK, because whatever you vote you will ALWAYS get a Tory government. I genuinely feel very sorry for you, but I MUST vote for a better future for me and my dependents, so I will vote accordingly. Oh yes… well done! I’m sure Cameron and all the entrenched establishment political parties are quaking in their boots! and i’ve told you before you told me that my right arm gets very painful and weak if i type too much..my opinion is contained in that post, but if you are too lazy to see that that is your problem…. OBD – What complete and utter crap! You have just written to say that your arm is too weak and painful to write! If you have an opinion of your own then please give it, if not, then shut the f*ck up and stop whinging. OBD – I assume that your failure to reply means that you don’t have any opinions of your own, or that the RSI in your arm is so painful that you can’t possibly type anything. If so, stop whinging and use your other arm, or your foot, or whatever. If you have something worth saying, then say it by whatever means you have at your disposal. If not, then STFU. maybe London should have a vote to become an indepent state. that way we’d all be happy. That’s a brilliant and well-written idea! Why did nobody think of it before?